Everybody immediately recognizes the Monarch which is the most famous butterfly in the world. Right? Guess again. 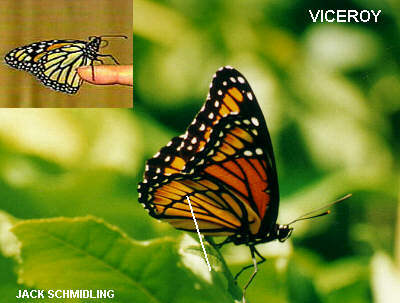 This nearly identical look-alike is the much less common Viceroy. They tend to be a bit smaller than the Monarch but the only sure difference between the two is the semi-circular vein on the underside of the hind wing. Note that the Monarch in the inset, resting on Marilyn's finger has no such vein. The Monarch caterpiller thrives on the Milkweed which makes it and the adult Monarch very distasteful to birds. Once a bird tries to eat one, it avoids them and anything that looks like a Monarch in the future. Through natural selection, the Viceroy has evolved to look enough like a Monarch to be nearly immune to attacks by birds.